I ate four of these chickpea lettuce wraps the other day. Does this count as portion control? Oh, wait, I don’t care – they’re anti-inflammatory, vegan and delicious. I didn’t experience any shame, guilt or flatulence. You know what I experienced? Ummm, how about endless happiness and pride? After all in approximately 10 minutes my gifted hands had opened a jar full of chickpeas and had thrown together something that was super delicious, spicy and that would make excess inflammation crap its pants. 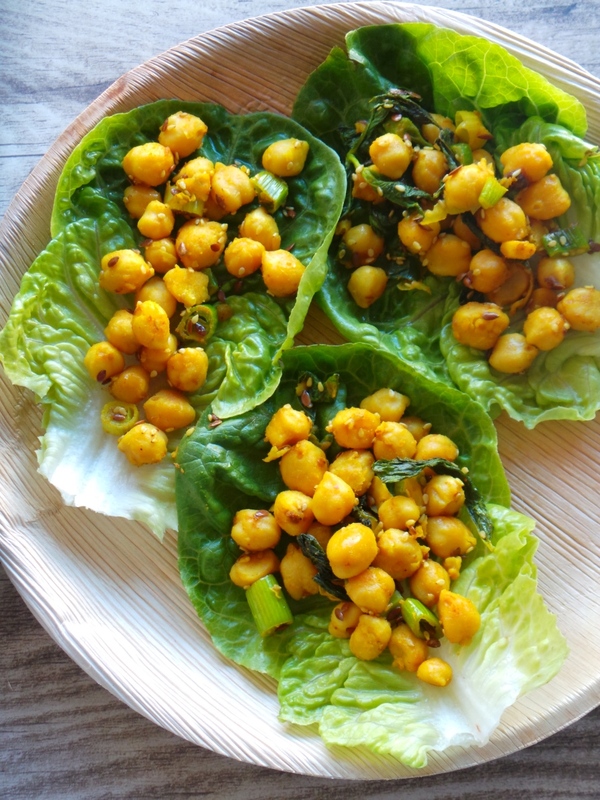 You don’t need to plan ahead, just let these chickpea lettuce wraps happen next time you need something quick to eat. Be spontaneous, be bold, be who you want to be, imagine you’re in a commercial for chickpeas…now open a jar of chickpeas. 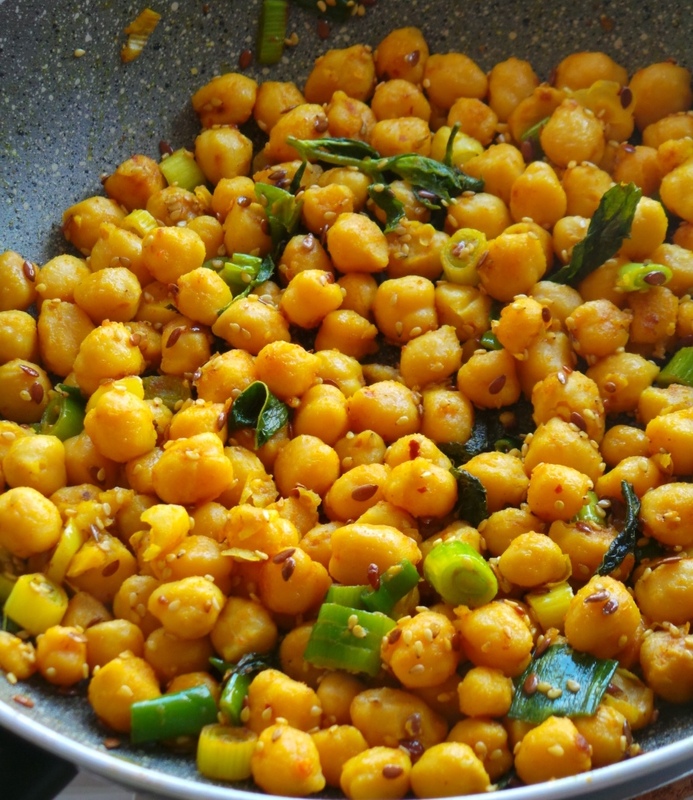 Heat them in a pan with some water, add some turmeric, cumin, flax seeds and about 6 more ingredients. Put it on top of the chickpeas in a lettuce leaf. Smile and then call the whole thing a (lettuce) wrap. The salad will make the lettuce wraps even better and will add more garlic and more vegetables to your daily life. You can’t really ask for more. That garlic will also keep bad bacteria (and some vampires) away from the salad, so it doesn’t spoil too fast and it doesn’t disappear (keep it in the fridge though). These wraps are light, fresh & spicy and I insist you make them during the next 10 minutes. 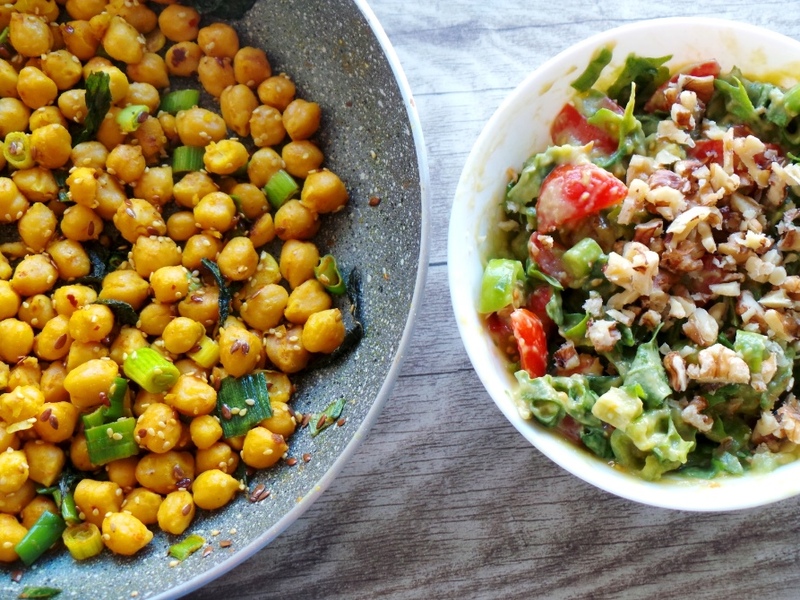 You can use whatever vegetables you have for the salad and you can actually use lentils instead of chickpeas, but it will take a little longer to cook, also you’d need to add some salt while cooking. I haven’t tried these wraps with beans, but that might work as well. Also if that’s important to you – you won’t be eating that devil called gluten here. For all my vegan friends out there – these are also vegan. There are many very anti-inflammatory star ingredients here, among others: turmeric, cumin, garlic and flax seeds. You eat those more often and you keep a lot of diseases away – from arthritis and flu to cancer & cardiovascular disease. Also for anyone with acne – these lettuce wraps are low GI, contain no dairy and provide you with many antioxidants. Those are the 3 main things you need to consider in your diet if you want to get rid or at least reduce acne. These wraps are also high-fiber, high-protein a good source of minerals, vitamin C, folate, biotin, and omega-3’s. Make sure there is almost no water and add the rest of the ingredients (olive oil, onion, garlic, cumin, flax seeds, sesame seeds, mint leaves) stir together for about 1 minute turn off heat and cover with lid. In a small bowl smash avocado and ½ chopped tomato, add lime juice and minced garlic – stir until smooth. You can also use a hand blender to make this smoother. Add the rest of the salad ingredients and some salt to taste and combine. Top with some crushed walnuts for some more nutrition and crunch. Place 2 tbps of the chickpea filling in the middle of a lettuce leaf and 2 tbps of the salad. Repeat about 5 more times. Eat right away. You can store the salad and the chickpea filling in the fridge for up to 1 day (salad is best when it’s fresh). And that’s it. 10 minutes and you’re not hungry anymore. Let me know how it goes! excited to make the chickpeas but the avocado will keep me from the salad. Any swap out salad suggestions?